One of the tricky things about meteorology is that it happens in three dimensions above the surface of a rotating sphere. In fact, if you add in time, it is four dimensional. Yet we only have two dimensional graphics from which to build our understanding of it; its rather like building the picture of a garden viewed only through the narrow gaps in boundary fence. 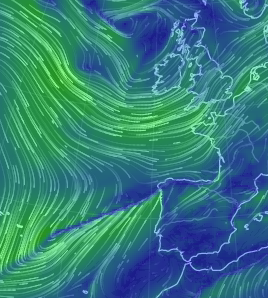 This featured picture has a stable south westerly jet-stream flow aloft, marked by cirrus which weaves itself across a lower level unstable north westerly from the direction of Cape Farewell, the southern tip of Greenland. Such differential motion of low and high level clouds give rise to traditional seagoing forecast rules of thumb and allow an observer to detect whether they are ahead or astern of a storm. Of course, a peek at the ships log might tell them that. 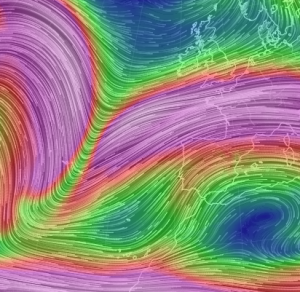 Jet stream is shown here from Earthnullschool’s 250mb streamlines. 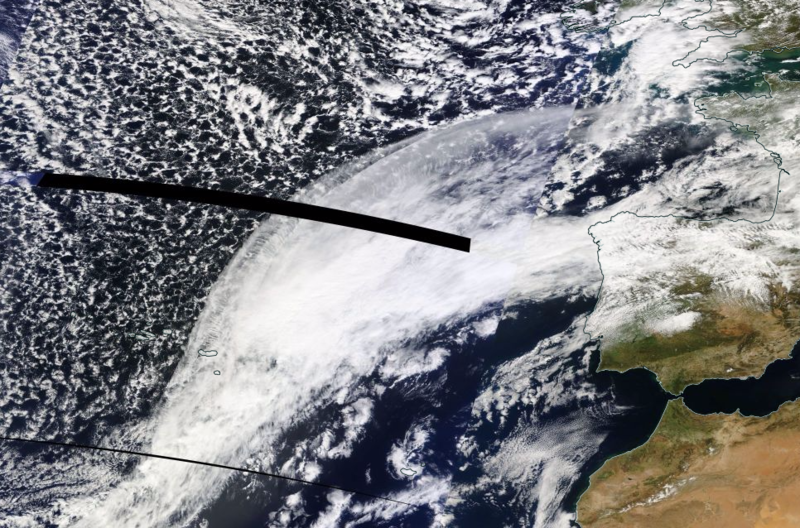 This matches the shape of the cirrus in the satellite picture above. 250mb stream lines, 29 Mar 16, ENS. In this case, cumulus at lower levels moves from the north west whilst cirrus at high levels comes from the south west. The area does lie to the south west of the complex Atlantic low in the aftermath of storm Katie and pressure is building heralding more settled weather to come.